All Winners Comics #1, Journey Into Mystery #83, All-Flash #15 Values? All Winners Comics #1 6.0 grade, Journey Into Mystery #83, All-Flash #15 6.0 grade. The Journey Into Mystery #83 is a 1966 reprint. 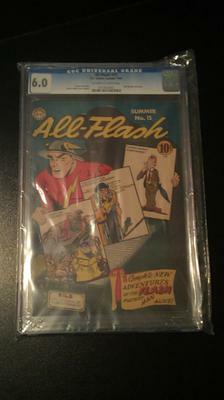 The All- Flash #15 had never been restored, but as stated is a 6.0 grade. Editor's reply: Nice lot, and thanks for following up with photos. 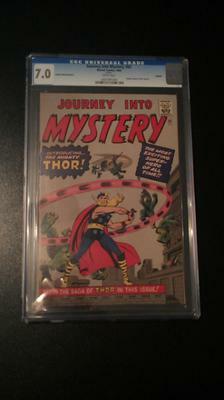 Journey into Mystery #83 Golden Records Reprint originally came bundled with an LP record of the comic. It's collectable if in nice shape. CGC 7.0 is solid but not spectacular. I would expect this to sell for $300-$350. Click for values. 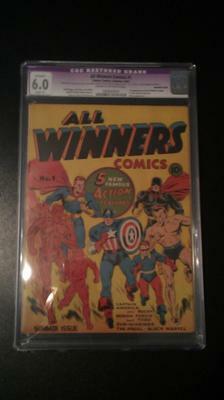 All-Winners #1 is a nice find, though the pic is too blurry to make out the type of restoration. An unrestored one would be worth MUCH more. Still, it should sell for between $2,000 and $3,000. Click for values. Finally, All-Flash #15 is surprisingly the runt of this litter, worth a shade under $200. Click for values.